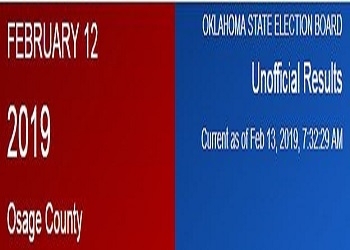 Pawhuska voters failed to choose a ward-2 city councilman on Tuesday. Jourdan Foran and Steven Holcombe will advance to a runoff election in April. HOlcombe edged Foran by 7 votes in the primary, leading 144 to 137. Laban Miles picked up 97 votes for just more than 25 percent of the vote. Holcombe and Foran garnered 38 and 36 percent of the vote respectively. Shidler voters said a strong yes to a school proposition. The issue passed with 77 percent of votes saying yes.